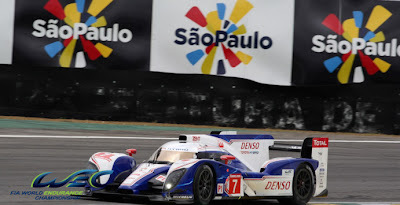 TOYOTA Racing took its first pole position thanks to a brilliant lap from Alex Wurz in qualifying for the Six Hours of Sao Paulo at Interlagos, the fifth round of the FIA World Endurance Championship. In only its third race, the TS030 HYBRID, which Alex shares with Nicolas Lapierre, was 0.784 seconds faster than the competition to earn top spot on the grid for tomorrow’s race. The team played a strategic waiting game in qualifying, remaining in the pits until only six minutes from the end. But Alex wasted no time in taking top spot with his first flying lap and he improved his time immediately with his next effort. Today’s result marks a milestone in the development of hybrid powertrains; it is the first time a super capacitor-based system has earned pole position for a major international race. The super capacitor in the TOYOTA HYBRID System – Racing is charged in five designated braking zones around the Interlagos circuit to deliver a significant power boost later in the lap. Earlier today, the team used this morning’s final one-hour practice session to optimize the set-up of the TS030 HYBRID. Nicolas started the session before handing over to Alex for the final 15 minutes. Alex used the time to prepare for qualifying, although heavy traffic around the relatively tight Interlagos track denied him a clear lap and a chance to demonstrate the true one-lap pace which was very evident later in the day. Following Saturday morning’s warm-up (08.00-08.20) the six-hour race begins at midday with a rolling start.